Because this was very requested, today I've uploaded a patch Mint Menu in our MintMenu PPA, which includes a link to the Ubuntu Software Center. In case you don't know, we maintain a PPA for easily installing MintMenu in Ubuntu. However, the original MintMenu does not include a link to the Ubuntu Software Center (I've named it "Software Center" so the name doesn't get truncated) so the only way to launch USC when using MintMenu was from the command line. But this changes with the patch today (nothing major, just changed 2 lines of code) - as you can see in the screenshot, you can launch Ubuntu Software Center directly from the MintMenu. 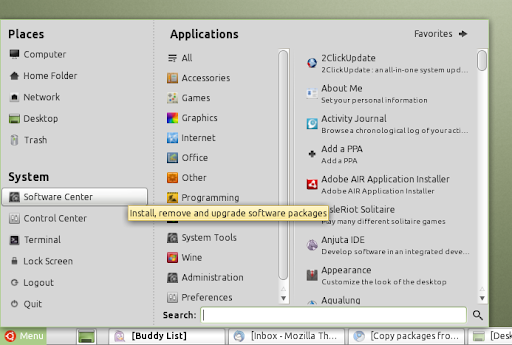 I also took this opportunity to upload MintMenu packages for Ubuntu 11.04 Natty Narwhal so if you're using Natty already, you can already use MintMenu (but I haven't tested it on Natty yet). 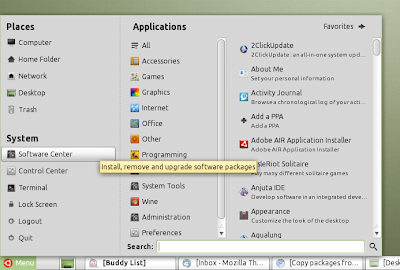 MintMenu is also available in the main WebUpd8 PPA! Thanks to WebUpd8 reader Joe for the MintMenu patch!